Preclinical testing by using appropriate tumor models in small animals represents an important step in the development of new therapeutic regimens as well as imaging agents. Recently, genetically engineered mouse models of various types of human cancers, including hepatocellular carcinoma (HCC) [1, 2] have been developed. The availability of these models has enabled the implementation of preclinical anti-tumor drug testing in a natural microenvironment and thus provides a new and powerful paradigm for drug development [3, 4]. 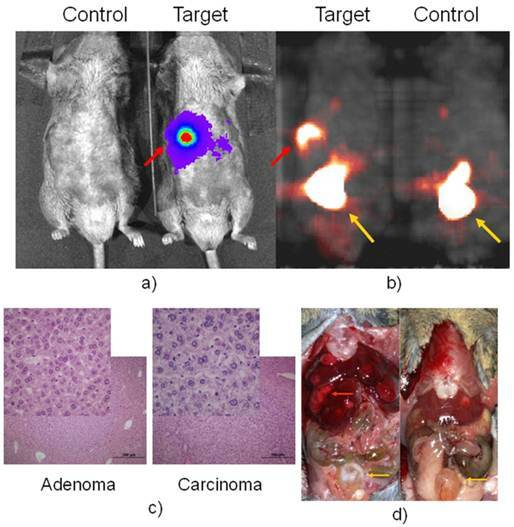 Meanwhile, in vivo imaging enables the evaluation of these therapeutic drugs in treating naturally occurring cancers in live animals. To combine these efforts, a mouse model with imaging reporters to monitor HCC development and progression was created . The alpha fetoprotein (Afp) is a secreted polypeptide whose normal expression is strictly restricted to developing fetal tissues, particularly in the developing fetal liver in both rodents and humans. It is also expressed in regenerative liver injury and ultimately in liver tumor such as HCC. Approximately 70% of HCCs are positive for Afp, and levels of Afp increase with tumor progression . A strategy was adopted to create a knock-in mouse model by putting the reporter genes, firefly luciferase (luc) and HSV1-tk, under the control of Afp promoter such that molecular imaging can be used to follow Afp promoter activity for liver damage, tumor development and progression. 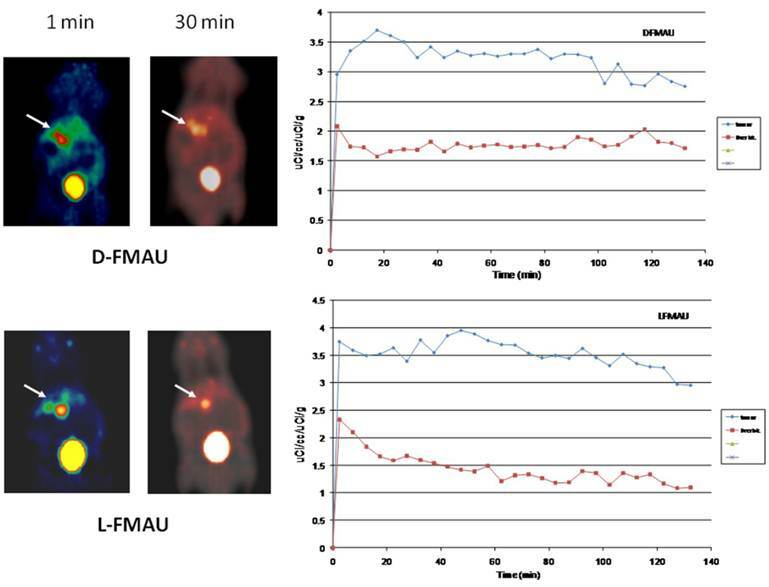 For the two genes knocked-in: tk is suitable for quantitative nuclear imaging by PET or scintigraphy, and luc for relatively easy-use bioluminescent imaging (BLI) in high frequency screening/monitoring. There is a group of radiolabeled thymidine analogs that have been tested for imaging herpes viral thymidine kinase (HSV1-tk) or its variants used as reporter gene [7-9]. Initially, radiolabeled 2'-fluoro-2'-deoxy-1-β-D-arabinofuranosyl-5-iodouracil (FIAU) was the tracer for imaging HSV1-tk expression  although 2'-[18F]fluoro-5- ethyl-1-beta-D-arabinofuranosyluracil (FEAU)  and others appeared to be the tracers of choice for that purpose . On the other hand, 9-[4-[18F]fluoro-3-(hydroxymethyl)butyl-]guanine (FHBG) was developed specifically for imaging a point-mutated version, the sr39tk . In this study, FIAU was used during the initial phase of creating the knock-in mouse model. Once HCC was induced, a pair of thymidine analogs, 1-(2'-deoxy-2'-[18F]fluoro-β-D-arabinofuranosyl)thymine (D-FMAU) and 1-(2'-deoxy-2'-[18F]fluoro-β-L-arabinofuranosyl)thymine (L-FMAU) , were compared for PET imaging of tk expression in this unique mouse model of induced HCC. FHBG, which incidentally showed uptake in some induced HCCs, was also tested. Chemical structure of these nucleoside analogs are shown in Figure 1. The use of this novel mouse model with the matching radiotracer instead of the conventional xenograft tumor models offered unique opportunity for studying liver injury, liver cancer development, and hopefully for evaluating new anti-cancer therapeutic compounds in the future. Thymidine (TdR) and its analogs. Red-colored atoms are the positions for radiolabels: C for C-11/C-14, F for F-18, I for radioiodides. FMAU can have F-18 or C-11. Knock-in animal model. Gene targeting technology was used to create a mouse strain in which a tk-luc dual-reporter fusion gene cassette (designated as Afp-tk-IRES-luc) was inserted behind the Afp promoter . This strategy is illustrated in Supplementary Material: Figure S1. All mice generated were cared for in accordance with guidelines set forth by the American Association for Accreditation of Laboratory Animal Care and the USPHS "Policy on Human Care and Use of Laboratory Animals," and all studies were approved and supervised by Case Western Reserve University Institutional Animal Care and Use Committee. Our prior studies have shown that the expression profiles of tk and luc in these mice were identical to that of endogenous Afp gene. In addition, the expression of these exogenous proteins did not result in any significant adverse effects to these knock-in mice carrying the imaging alleles . In this paper, we evaluated these mice followed by HCC induction with carcinogen with both BLI and microPET with different radiolabeled deoxynucleoside analogs. Initial evaluations: The mouse model created using the above mentioned knock-in gene targeting approach was used for initial evaluation since the expression of the endogenous Afp gene is highly specific for the developing fetal liver, and then liver injury in adult mice. First, one day after birth, five (5) mouse litters that weighed 1.4g on averaged were weighed precisely for calculating the amount of D-luciferin (Biosynth AG, Switzerland) to be carefully injected i.p. into the individual pups at 75 μg/kg body weight. Then, these one-day-old pups were placed confined to prevent movement during BLI, and positioned on the platform of a PIXIS 1000 cooled-CCD camera system (Princeton Instrument, Tucson, AZ), which is one component of the dual-modality imaging system built by Thomas Jefferson National Lab (Newport News, VA). 3 minutes after injection of D-luciferin, 6-minute-imaging sessions were performed. During imaging, the animal was not put under any anesthesia. The litters were put back in the cage to let grow after the initial BLI. Signals from BLI in the liver indicated the expression of Afp. Three day after birth, pups were injected with 15-20 µCi (0.555-0.74 MBq) of [125I]-FIAU. Two days after injection (5 days after birth), they were anesthetized and imaged by planar scintigraphy with a bronze collimator and X-ray at several time points on the same specially designed multimodality imager for small animals until scintigraphic signals became clear after the washout of the non-binding FIAU. Liver injury: When the above mentioned transgenic mice grew into adults starting at week 8, CCl4 (Sigma) was injected i.v. into four (4) of these animals. 24 hrs later BLI imaging was performed for each animal, in which D-luciferin was injected i.p. into the mice at 100 μg/kg body weight. 6 minutes after injection, the anesthetized animal was placed supine and tapped at the plate of the same PIXIS 1000 cooled-CCD camera for two 6 minutes imaging sessions. During imaging, the animal was under anesthesia with isoflurane gas (1.5% mixed with oxygen) through a gas anesthesia system (EZAnesthesia, Palmer, PA). Before imaging the front of the mice were shaved to reduce the light absorption by the furs during BLI. Each animal was then injected with about 80 μCi (2.96 MBq) of [125I]-FIAU in 200 μL solution for imaging tk expression. The animal was then placed prone on the second imaging platform of the combined tri-imaging modality system. This time, a planar X-ray image was taken followed by a 2 minutes planar gamma scintigraphic acquisition with the same bronze collimator specially designed for imaging I-125 on small animal models. Throughout the imaging session, the gas anesthesia system was used to keep the animal on the scanner. The 24 hr point after [125I]-FIAU injection (48 hrs post CCl4 treatment) was used as it was thought to be the optimal time point for imaging tk expression using labeleled FIAU . HCC induction and model validate. Batches of transgenic mice and fewer wild type littermates were prepared for different imaging experiments described below. All were subjected to a single i.p. injection of 20 µg/g body weight of diethylnitrosamine (DEN, Sigma) 14 days after birth. By 9 months, these animals were subject to BLI and PET imaging for tumor detection. After imaging, the animals were euthanized by overdosing with pentobarbital (~200 mg/kg) and cut open for photography and tissue harvesting. Livers were excised, weighed, and examined for macroscopic lesions. According to standard methods, livers were fixed in 10% neutral buffered formalin (Fisher Scientific, Pittsburgh, PA) or Z-FIX (ANATECH LTD, Battle Creek, MI), dehydrated, embedded in paraffin, sectioned serially at 5 µm, and stained with H&E. Radio-Labeling. [125I]-FIAU was kindly provided by Dr. Dongfeng Pan of University of Virginia. The radio-synthesis followed a published method . [18F]-FHBG was synthesized on-site according to literature method [9, 15]. D-FMAU was first labeled with C-11 . F-18 labeling of D-FMAU was reported later  and has been used in animal and human studies . The radio-synthesis of F-18 labeled D- and L-FMAU were conducted following the general approaches , and were modified slightly in this study according to the recently published methods for synthesizing F-18 labeled D-FMAU . H-3 labeled D- and L-FMAU were purchased from Moravek (Brea, CA) and used for cell uptake assays. BLI. To detect luciferase activity using BLI in the carcinogen treated mouse which carry dual reporter gene tk/Luc, mice belly were shaved before imaging to avoid the light absorption by the fur. D-luciferin was injected i.p. into the adult mice at 100μg/kg body weight. 6 minutes after injection, the animals were placed supine and side-by-side (target with carcinogen treatment and control animals) at the plate of Xenogen IVIS 200 cooled-CCD camera system (Palo Alto, CA) for two 3 minute imaging sessions. During imaging, the mice were anesthetized continuously via inhalation of the same isoflurane gas. Using 3 min instead of 6 min is because the sensitivity of Xenogen IVIS 200 is higher than that of PIXIS 1000 that is used mainly for initial screening. The BLI images were then pseudo-colored and overlaid on top of a conventional photograph of the animals. PET imaging with FHBG. Two (2) target/control pair was placed prone on the imaging bed of a microPET scanner R4 (Siemens/Concord, Knoxville, TN). A similar gas anesthesia system was used to keep the animal on the scanner bed. A 20 minute transmission scan was conducted using a sealed point source to get the attenuation map. 250 uCi (9.25 MBq) of [18F]-FHBG in 200 μL of saline solution was injected via tail vein into each animal. 40 minutes later, a 30 minutes emission scan was conducted in list mode acquisition. After the scan, the acquired data were binned into 5 minutes frames and reconstructed with attenuation correction using the ASIPRO package on the R4 scanner. The last frame of the emission images was colored in hot-metal and was superimposed on the transmission image. Immediately after euthanasia of the animals, the abdominal of the animal was open to examine the liver tumor and organs for correlation with the imaging results. Dynamic PET imaging with D- and L-FMAU. For the next batch of carcinogen-treated transgenic animals, this pair of tracers were applied to the same animals (n=4) for microPET imaging in a sequence two days apart. This time, list-mode scans were acquired starting at tracer injection, and lasted for 135 min. The acquisition was binned into 5-min frames, and reconstructed with attenuation correction using the same ASIPRO into a dynamic sequence. Regions of interests (ROI) were drawn around the liver cancer as well as on a liver lobe without tumor. The time activity curves from these ROIs were generated for D- and L-FMAU uptakes on the same animals that were scanned two days apart. Cell isolation. As a make-up study, three (3) additional animals were scanned with each tracer two days apart for 10 minutes at 50 minutes post-injection of each tracer. Tumors from DEN-treated mouse livers were harvested after imaging from these reporter-gene knock-in mice. Minced tissues were digested with 1mg/ml type IV collagenase for 45 minutes at 37°C. After washing with complete medium twice, cells were filtered, spun down, and re-suspended. Cells were grown in DMEM supplemented with fetal bovine serum, 100 units/mL penicillin, 0.1 mg/mL streptomycin, and 0.25 μg/mL amphotericin, Insulin-Transferrin-Selenium-A Supplement (Invitrogen) and non-essential amino acids (Sigma), plated on six-well plates pre-coated with 30 μg/mL collagen and maintained at 37°C in an atmosphere of air and 5% CO2 to be used later for cell uptake assay. Cellular uptake and efflux of L- and D-FMAU. For each FMAU tracer, 1x106 cells were used, which were cultured in a T75 culture flask; the assay was performed within 24 hours after plating/passaging of the cells. Each assay is triplicated. First, cells began with incubation in 5 mL of DMEM (supplemented with 10% FBS, Pen/Strep/Glutamine, Fungizone, 25mM HEPES) and 10 μCi (370 kBq) of H-3 labeled either L- or D-FMAU for 5 minutes at 37 °C (pulse). After incubation, the media was aspirated and the cells washed three times with 5 mL PBS. 5 mL of DMEM was added and left for the time (efflux) periods of 0, 15, 30, 60, and 90 minutes. After each designated efflux period, the media was separated from the cells. The cells were then washed twice with 5 mL PBS and trypsinized with 1 mL of trypsin and transferred to a screw-top microcentrifuge tube, and 0.5 mL of ice-cold DMEM was added. The tube was centrifuged at 1500g for 5 min at 4 °C. After that, the supernatant is aspirated and the cells washed/resuspended in 1 mL distilled, deionized (DDI) H2O and are centrifuged again at 1500g for 5 min at 4°C. After centrifugation, the supernatant was discarded and pellet of cells resuspended in 1.2 mL DDI H2O and ten 0.5 mm glass beads added to the screw-top microcentrifuge tube for cell lysis via beatbeating. 5/6 (1.0 mL) of the resulting supernatant was used to measure the total radioactivity with the cells by liquid scintillation counting. 1/6 (0.2 mL) was used for protein measurement via the Bradford method (Bio-Rad Laboratories, Inc., Hercules, CA). The measured radioactivity (via liquid scintillation counting as DPM) at each time point for each replicate was normalized to the amount of released protein (via Bradford method) factoring-in the difference in volumes. Initial evaluations: The one-day-old mouse litters were imaged by BLI and shown in Supplementary Material: Figure S2. As mentioned in the Supplement, about half of them were positive for the reporter allele. In addition, it is quite a challenge to perform i.v. injection of radio-tracer into the newborns for scintigraphic imaging. Three day after birth, pups were successfully injected i.v. with a small amount of [125I]-FIAU. Two days after injection (5 days after birth), the non-binding FIAU was cleared out of the general circulation and the planar scintigraphy was performed while the young pups were put under much lower anesthesia (<0.5% of isoflurane mixed with oxygen) to prevent movement during imaging as they grew rapidly, and at the same time to ensure that the young animals survived the scanning. However, that introduced some inadvertent movement. Despite of this movement, which cause some blurring during the longer (2 minutes comparing to seconds during x-ray) scintigraphic scan, positive mice showed liver uptake while negative controls had lower abdominal non-specific uptake as shown in Supplementary Material: Figure S3. When these mice reached the age of 8 weeks, CCl4 was injected i.v. into these animals. Figure 2 showed BLI as well as scintigraphic imaging of both reporter positive and negative mice 48 hrs after CCl4 treatment (24 hrs post FIAU injection). Thyroid uptake was imaged for both reporter positive and negative mice indicating free radioiodide from de-halogenation of labeled FIAU, which served as an internal control for I-125 imaging. All these planar images were used for qualitative assessment of the newly created animal model. 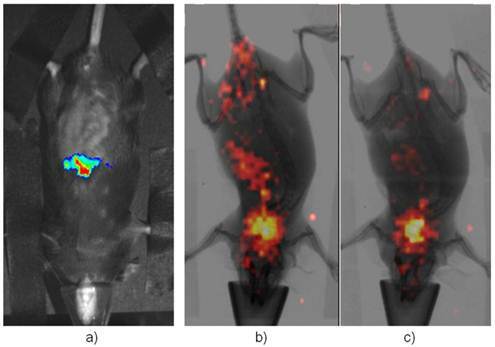 PET imaging of HCC with FHBG.Having confirmed that luciferase was detected in the fetal liver and injured adult liver, but none of the normal adult tissues of Afp-TK-ires-Luc mice, it was logical to investigate whether the tk-luc fusion protein were indeed expressed in HCC induced in these mice at the levels that could be detected in live animals by BLI and PET imaging, respectively. HCC can be readily induced in either C3H inbred mice or C57 BL/6j-C3H F1 hybrid mice. After treated with carcinogen DEN, HCC developed in these mice in a manner similar to that in wild-type C57 BL/6j-C3H F1 hybrid mice (data not shown). BLI was used to monitor the development of HCC, and found liver signals early on. microPET imaging was first performed on these mice 9 months after DEN treatment. Figure 3 showed a pair of DEN-treated and non-treated mice, in which only one very strong spot was detected with both BLI and later the corresponding PET with FHBG. [18F]-FHBG was used only once on two pairs of mice due to a scheduling issue. Right after PET imaging, autopsy revealed that each of these animals had numerous tumours. Interesting, pathological analysis revealed that some of these tumours were adenoma (Figure 3c), but others were carcinoma that did not show FHBG uptake. Imaging Afp onset in adult liver after the treatment of CCl4. a) is a representative BLI of the positive mice while b) is the same mouse in a) but imaging with [125I]-FIAU after BLI. c) is a representative of negative control under-going the same scintigraphic imaging with FIAU. Its BLI image showed no signal (not shown). Both had thyroid uptake of I-125 indicating dehalogenation of [125I]-FIAU over the time. BLI in a) with D-luciferin for luc expression and microPET in b) with FHBG for tk expression of a positive and negative pair. Autopsy after imaging was shown in d). The red arrow pointed to Afp positive nodule, which is confirmed as HCC in c) while other liver nodules are confirmed as adenoma, the inserts are a portion magnified from their respected histology slide. The yellow arrow pointed to the bladder where tracer clearance accumulated. PET imaging of HCC with D- and L-FMAU. Because some of the liver nodules were not picked up by FHBG. Therefore, dynamic PET scans were performed on the next batch of carcinogen-treated transgenic animals. The pair of tracers, D- and L-FMAU, were applied to the same animals for microPET imaging two days apart. Regions of interests (ROI) were drawn around the liver cancer as well as on a liver lobe without tumor. The time activity curves of tracer uptake were generated from these ROIs centered on liver cancer (with focal tracer uptake) and a liver background region shown in Figure 4. Both D-FMAU and L-FMAU have seen liver tumor uptake where the tk gene is expressed under the Afp promoter. The focal uptake was depicted differently between D- and L-FMAU for the same liver nodule. L-FMAU showed better tumor uptake to liver background ratio along the timeline. Cell uptake assays. Cells derived from the tumor post-imaging were divided and pulsed with H-3 labeled D- and L-FMAU separately for 5 min is to mimic in vivo tracer accessibility in circulation. The tracer efflux from the cells into the medium at different time points is used for correlation with dynamic PET imaging data. Figure 5 showed comparable cellular tracer uptake between D- and L-FMAU for most time points: 30 min, 60 min and 90 min, especially the 60 min point when the static scan usually takes place. This echoed the time activity curves (blue lines) of the two tracers in Figure 4. Recent progresses in transgenic and gene targeting technologies in mice have demonstrated the great power of the use of reporter-gene-based imaging in studying biological processes. We have created a mouse model for studying acute liver injury and naturally occurring hepatocellular carcinoma (HCC) using a knock-in gene targeting approach. In this mouse model, the dual reporter construct encodes firefly luciferase (luc) and herpes viral thymidine kinase (tk) and the expression is under the control of an endogenous Afp promoter. Therefore, both BLI and PET imaging may be used to monitor the status of liver, depending on logistics, cost and specific circumstances. Our previous studies have shown that the expression profiles of tk and luc in these mice were identical to that of endogenous Afp gene. Furthermore, the introduction of the tk-IRES-luc cassette into the Afp locus and the expression of these exogenous proteins did not result in any significant adverse effects to these mice. The mouse Afp promoter is active during embryonic development in several tissues including the fetal liver peaking at birth, but it becomes inactive in normal adult mice. However, Afp is re-activated when hepatocytes are damaged or transformed into HCC cells. Both BLI with virtually no background and microPET with radio-tracer uptake could be used to image that re-activation as shown in Figures 2 & 3. Comparing to the commonly used xenograft models, this set of mice provides an excellent small animal model for studying liver injury, liver cancer and treatment assessment in vivo by monitoring the expression of the Afp-driven reporters. Tracer comparison between D- and L-FMAU on the same animal models. Although there is a variation for each tracer applied a batch of mice, the general trend holds for each tracer. Both D- and L-FMAU showed lasting uptake in the tumor with L-FMAU showed more focused uptake and faster clearance than D-FMAU. Comparison of D- and L-FMAU uptake in multiple liver foci with comparable uptake in cells derived from the liver nodules. Showing on the left are PET images from the same animal after stabilization of tracer uptake (30 min post-injection, T30) while D- and L-FMAU applied on this batch of mice behaved very similar to their counterparts in Figure 4. Cell uptake assays on the right using derived tumor cells post-imaging showed comparable normalized uptake with both H-3 labeled D- and L-FMAU for most time points. FIAU was used to image the newborns, and later to assess acute liver injury. Tracer kinetics of FIAU was well known as it circulates in the mice for 24-48 hrs for clearance . De-halogenation of FIAU in vivo over the time was also known , and our initial study showed intense thyroid uptake in all mice. FHBG was used in this study by accident, and it did not show uptake in some of the liver nodules. FHBG was initially developed specifically for imaging a point-mutated sr39tk, not the original tk . It is not surprising to see this lack of performance in the animal model expressing the tk gene. Some of these nodules were adenomas, but Afp was activated in some of the carcinoma as it is well-known that Afp is active in 70% of HCC . Comparison studies were performed for multiple tracers through dynamic scans. For the group of the animals shown in Figure 4, both D-FMAU and L-FMAU have seen stable uptake in the liver tumors. The cellular tracer uptake assays using cells derived from these tumor confirmed that. However, there is a slight difference in signal-to-background ratio as well as tracer clearance (tracer kinetics) between D- and L-FMAU. Variations exist among each group of mice, but the general trend about a tracer's signal-to-background ratio and clearance holds as L-FMAU showed higher tumor uptake vs. liver background as well as a steady washout for non-binding molecules. Unfortunately, attempts to establish cell lines from the liver tissues surrounding liver tumors/nodules failed. 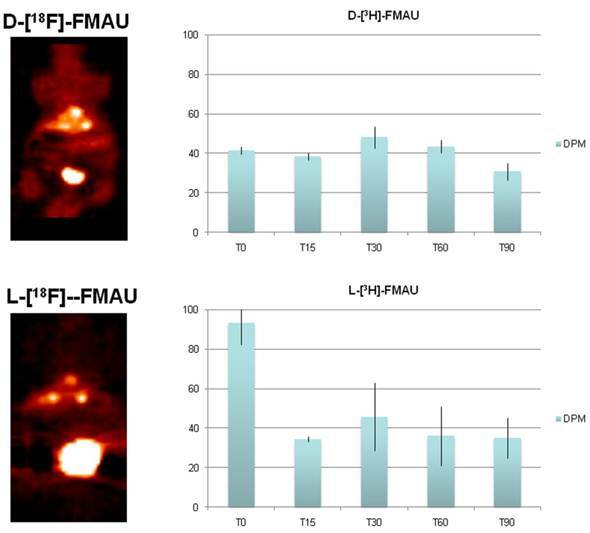 A comparison on cellular uptake of various tracers between these cells and the tumors cells would have explained the signal-to-liver contrast shown in FMAU images (red lines in Figure 4). 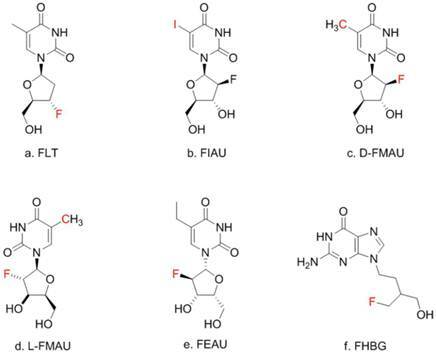 Being a non-natural occurring nucleoside analog as comparing to its D-enantiomers such as FLT, D-FMAU, etc., L-FMAU seems to be advantages for liver and liver cancer imaging due maybe to its resistance to hepatic degradation (in hepatic parenchyma). Future studies would concentrate on using L-FMAU for assessing liver injury, and for assessment of response to therapeutics applied on these models for liver cancer treatment. We demonstrated the use of a newly created mouse model, in which firefly luciferase and a version of herpes viral thymidine kinase were expressed only in fetal tissues, injured hepatocytes and in HCC cells. More importantly, the expressions of these two reporter markers could be detected in naturally occurring HCC tumor by BLI and by PET. Among the potential PET tracers for imaging naturally occurring HCC, L-FMAU seems to be better suited. The model can be further used for early identification of cancer-bearing animals, for monitoring changes of the disease in response to therapeutic interventions. In addition, the combination of this model with currently available tracers offers a potential new means for monitoring liver injury. HSV1-tk: herpes viral thymidine kinase; HCC: hepatocellular carcinoma; luc: firefly luciferase; Afp: alpha fetoprotein; BLI: bioluminescent imaging; DEN: diethylnitrosamine; FIAU: 2'-fluoro-2'-deoxy-1-β-D-arabinofuranosyl-5-iodouracil; FEAU: 2'-[18F]fluoro-5- ethyl-1-beta-D-arabinofuranosyluracil; FHBG: 9-[4-[18F]fluoro-3-(hydroxymethyl)butyl-]guanine; D-FMAU: 1-(2'-deoxy-2'-[18F]fluoro-β-D-arabino­furanosyl)thymine; L-FMAU: 1-(2'-deoxy-2'-[18F]fluoro-β-L-arabinofuranosyl)thymine; FLT: 3'-deoxy-3'-[18F]fluorothymidine; IRES: intra-ribosomal entry sequence; ROI: region of interest. We would like to thank Yiduo Hu and Ellen L. Barnes (Luo Lab) for their efforts in the creation of transgenic animal model; Hui Miao and Lizabeth Gerber (Wang Lab) for carcinogen-induced HCC; Stan Majewski, Carl Zorn and Andrew Weisenberger (Thomas Jefferson National Lab) for provide the combined planar imaging technology; Dongfeng Pan (University of Virginia) for providing [125I]-FIAU for the initial imaging experiments; Ping Cao, Nicolas Salem and Paul Anderson (Lee lab) for different stages of animal imaging experiments; and Yanming Wang for help with ChmeDraw. This project is supported in part by NIH Grants R01 DK077876, R01 CA92259, R01 CA152371 to B. Wang, and by NIH Grant U24 CA110943 to J. Duerk, and by a grant from the Ohio Biomedical Research and Technology Transfer (BRTT, J. Nadau). G. Luo is supported by NIH/NCI Grant R01 CA88939. Z. Lee is supported by NIH/NCI grant R01 CA095307.